Letting your child get martial arts training may not seem like a good idea at first because fighting tends to glorify violence, as portrayed in many movies, television shows, and video games. However, martial arts are far from the kind of violence that Hollywood describes them to be, and actually, there are many benefits of martial arts for kids. Martial arts classes usually begin with a bow to the master and warm-up exercises. Then, the students practice skills, which may include punches and kicks. All of these activities require concentration and self-discipline. Parents report that their children, especially those who have ADHD or attention deficit/hyperactivity disorder, develop these skills with success. Children become physically fit while doing warm-ups, which include jumping jacks, stretches, pushups, and other movements involved in martial arts. These exercises strengthen the muscles and challenge the cardiovascular system. This is why martial artists have physically-fit, toned, and flexible bodies, which your children will also acquire. Children will have the ability to defend themselves against possible assailants. Most martial arts experts use self defense as the cornerstone of the training program. While the skills will vary with each discipline, children will learn to defend themselves with regular practice. Martial arts teachers also teach kids street-smart techniques to help them avoid problems with bullies. Kids learn about respect from the moment they walk into a dojo. They learn to bow to their masters and instructors. Then learn to treat other students the way they also wish to be treated. In martial arts courses, punching, kicking, and other moves are done secondary to the respect they learn. Good martial arts instructors emphasize respect and instruct their students to be polite to teachers, parents, and peers. Children who are involved in martial arts become confident in themselves. Working through a belt ranking system in martial arts gives children measurable and realistic goals to achieve. By mastering a new technique or graduating to a higher belt, children will feel a sense of accomplishment, which follows them wherever they goes. Children learn to work not only on their own, but together with their masters and other kids in class. They help each other through sparring practices and other lessons to master new techniques, get a new belt, and accomplish their goals. 1. When Should My Child Start to Learn Martial Arts? 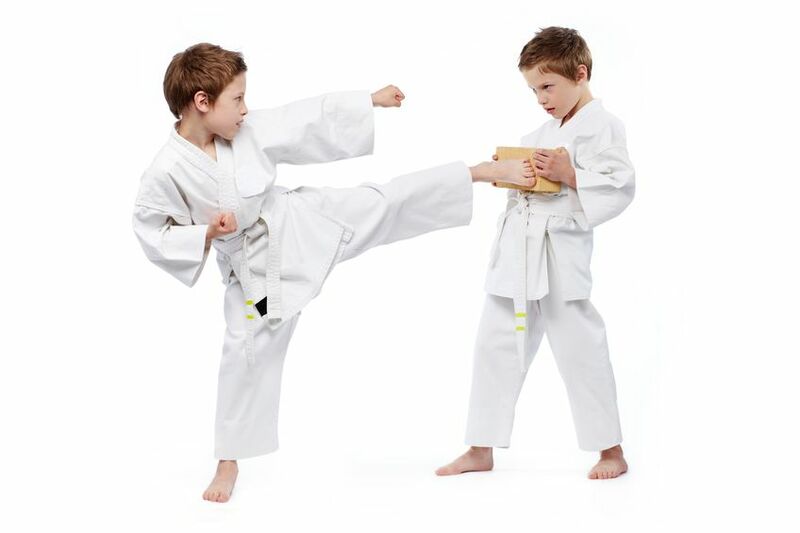 Ideally, children can start learning martial arts when they are at least six years old, because they have adequate muscle control for punching, kicking, and turning at that age. Although some schools offer training for younger children, their programs are usually game-oriented, and kids may not do well during the transition to more structured programs. 2. Which Martial Art Class Should I Choose for My Child? Tai Chi focuses on stretching, weight-bearing moves, and balance. It improves concentration, boosts flexibility, and proves to be easy on the joints. Kung Fu involves rigorous yet fluid movements, which make it easy on the joints. Its fast pace gives kids an aerobic workout. Wing Chun is a well-balanced martial art that combines striking techniques with grappling skills, and specializes in close-range combat. Karate is developed as a military art in the U.S. Karate uses kicks and punches, which involve quick, sharp movements. Kids have to do warm-ups carefully to avoid injuries. Judo is a competitive sport that teaches kids how to throw a sparring partner by using balance and proper leverage. It helps them learn respect for the opponent and build self-control. Aikido is gentle and noncompetitive. This is an excellent system for teaching children what is discipline and how to work with a partner. Tae Kwon Do is a popular form of martial arts. It uses punching and kicking movements as well as meditation and breathing techniques to improve focus. 3. Will Learning Martial Art Promote Violence? Martial arts training actually helps teach self-discipline, not violence, and improves socialization skills.Most martial arts classes teach kids non-violent skills to resolve conflicts and emphasize the value of avoiding a physical confrontation. 4. What Is the Belt System? A child learning a martial art progresses through different skill levels and attains a corresponding belt for each level. In the belt system, a beginner starts with the white belt and then goes through different belt colors until he reaches the black belt.